The best all day tour of Los Angeles & Hollywood for just $94 ($79 for children 12 and under - price includes all taxes and fees!). 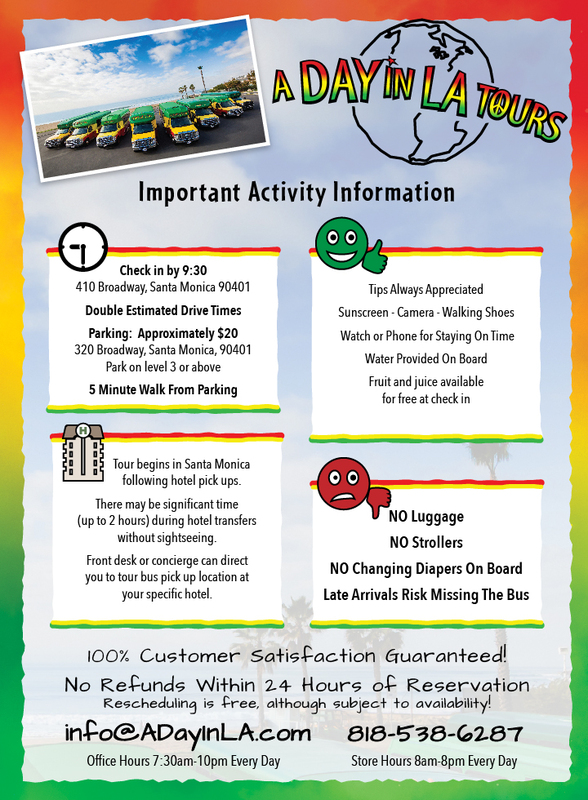 We want to show you all sides of LA - Free hotel pick up and drop off (in a limited range)! We know many visitors are in town for only a few days, so we want to make the most of your time. In one day we'll do everything from a trip through Venice and Santa Monica to LA's most notable highlights including Griffith Park, Sunset Strip, the Hollywood Walk of Fame, Rodeo Drive, and The Grove... plus much more! If you select a hotel pickup, you'll be part of other hotel pickups, which can be up to 2 hours before and 1 hour after the tour depending on your chosen hotel. If you meet us at our check-in point in Santa Monica (Or tour starting point in Venice), there is minimal downtime. IF YOU WANT TO BE ON A TOUR BUS WITH ANOTHER GROUP, PLEASE MENTION THE GROUP NAME IN THE COMMENTS SECTION. We require a minimum of 15 hours in advance to book this activity online. Alternatively, you can contact our office directly to inquire about short-term bookings. NO REFUNDS FOR CANCELLATIONS WITHIN 24 HOURS OF DEPARTURE. We will happily re-book you if space is available. Have another Day in LA? Check out Avital's Tours for a great food and touring experience! Also, If you are headed to San Francisco there is no better company to tour with than our partner over at Dylan's Tours!